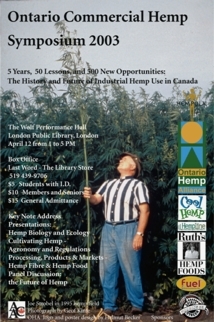 "5 years, 50 lessons and 500 Opportunities - the History and Future Of Industrial Hemp Use in Canada"
The Ontario Hemp Alliance (OHA), in recognition of the 5th year of commercial hemp production regulations, announces the "Commercial Hemp Symposium 2003" to be held in the new Wolf Performance Centre in downtown London, Ontario, on April 12 from 1 to 5 pm. The symposium hosts some of the world's experts on commercial hemp, including local legend Geof Kime of Hempline, hemp food experts Greg Herriott of Hempola Valley Farms and Ruth Shamai of Ruth's Hemp Foods. 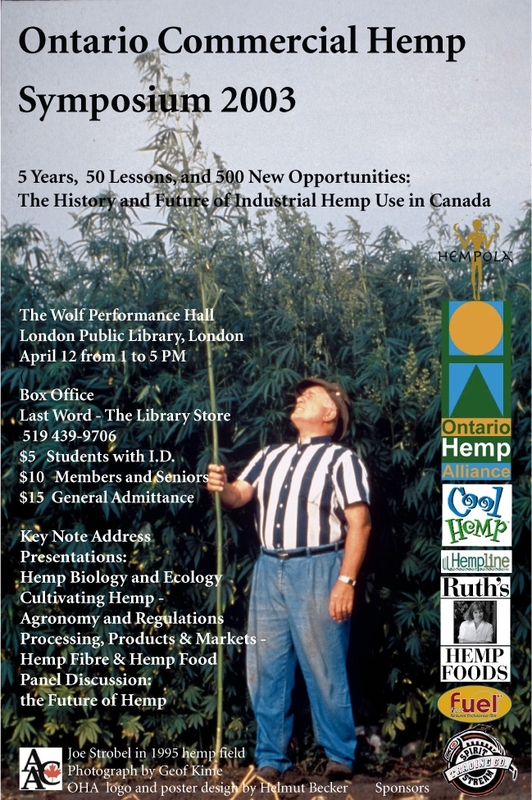 Helmut Becker, Professor Emeriti's from the University of Western Ontario and world famous hand made paper artist, will speak on the art of hemp as well as Federal and Provincial government representatives, like our own Ontario Ministry of Agriculture and Food new crops expert, Mike Columbus, will be on hand to add their perspective. No stone has been left unturned to bring together an interesting crop of the brightest and the best from the commercial hemp field. "The rise and growth of hemp businesses in Ontario over the past 5 years is a good example of the new triple bottom line -- social, environmental and commercial -- in action, " says Louise Hollingsworth, President of the OHA. "Ontario Hemp companies create healthy products that help create healthy communities. This is not only good business and good farming, but is simply common sense. For these reasons, industrial hemp is something worth celebrating, worth acknowledging and worth learning more about. That is why we are having this event in London in April this year." More and more we are hearing about industrial bio-fibers. "Hemp fiber has found its way into more vehicles in the past year, and, chances are good that many people have a natural no woven fiber product in their car and don't even know it," said Geof Kime, president of Delaware based Hempline and symposium speaker. "Hemp fiber has been found to be very cost-effective, with high strength and can be used as an excellent reinforcement fiber for replacing glass fiber, at a much lower price. The increasing commercial availability of hemp fiber and the demand for low cost, high strength fibers has resulted in new applications for hemp, particularly in automotive and construction products." Also on the bill is Ruth Shamai the brains behind Ruth's Hemp Foods. Ruth's Hemp Foods is now proudly a distributor of a machine that allows you to make your own Hemp Milk. This ultra nutritious version of hemp boasts a profile to open the eyes of the health industry - gluten free - high protein - excellent source of your essential fatty acids - hemp food is a growing industry. The symposium will begin promptly at 1 pm and will present a hemp overview, Agronomics, Regulations, industrial fibre uses, artisan fibre uses, hemp grain food, and a panel discussion on the future of commercial hemp. Time has been scheduled for questions throughout. The Farm Credit Corporation is buying all attending a cup of hemp coffee to enjoy while pursuing informative displays during intermission. Master Spinner Diny Warren and perhaps even Helmut Becker will present fibre demonstrations while Fast Fuel gives you a chance to munch on some really delicious hemp food. Many of our members have stepped up to help this event become a reality. Our sponsors include: Cool Hemp, Fast Fuel, Farm Credit Corporation, Hempline, Hempola Valley Farms, Ontario Ministry of Agriculture and Food, Ruth's Hemp Foods and Spirit Stream Trading Company. The door prize of 10 bags of hemp chips, donated by Hempline, is suitable to bed your horses or your flowers. Replace peat moss with the hemp chips in your spring gardening. Using hemp chips will help save a wetland and not influence your soils ph level. Junior Achievement of London has partnered with the OHA to manage the events ticket sales in one easy phone call - (519) 439-9706. Limited tickets are available for a dinner following the symposium from the Directors of the OHA featuring the Honorable Larry Dupery on "the Canadian Hemp Association - its role and ours". a larger, higher resolution image. Subscribe to The Hemp Report!